Shazam is a great addition to the iPhone. Ever heard a song on the radio or television, in a store, or at a club, and wondered what it was called or who was singing it? With the Shazam app, you may never wonder again. Just launch Shazam, tap Touch to Shazam, and point your iPhone’s microphone at the source of the music. If you have an iPhone 6s model, you can press the Shazam icon and choose the Shazam Now quick action shortcut (thus skipping the whole “tap Touch to Shazam” step). In a few seconds, the song title and artist’s name magically appear on your iPhone screen. Point your phone at the music and Shazam tells you the artist, title, and more. Shazam isn’t great at identifying classical music, jazz, big bands, show tunes, or opera, nor is it adept at identifying really obscure indie bands. But if you use it primarily to identify popular music or classic rock, it rocks (pun intended). As part of iOS 9, Siri now has Shazam technology built in, which means you don’t even need the app to identify a song. Just ask Siri what song is playing and she’ll usually be able to tell you. 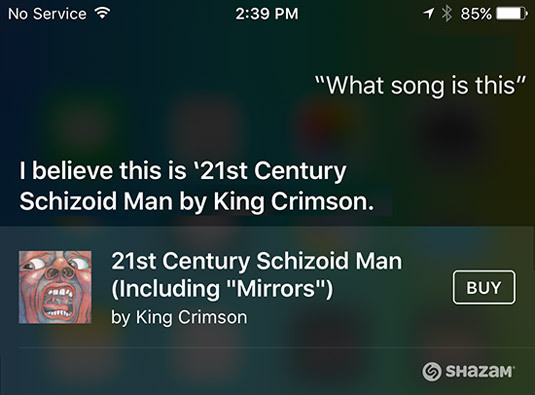 Siri uses Shazam to identify songs, even ones by eclectic artists such as King Crimson. 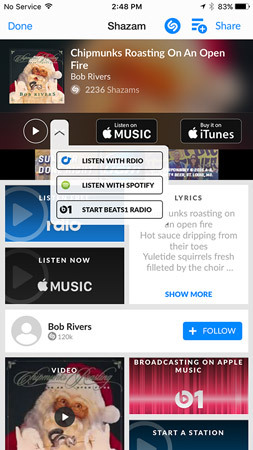 The free version of Shazam offers unlimited tagging but also displays lots of ads. If that works for you, you’re all set. But if you’re like us, you may prefer Shazam Encore, which eliminates the ads and has several exclusive features, including premium recommendations. Other apps claim to do what Shazam does, but good luck finding one as good as Shazam (free) or Shazam Encore ($6.99). It has worked in noisy airport terminals, crowded shopping malls, and even at wedding ceremonies.